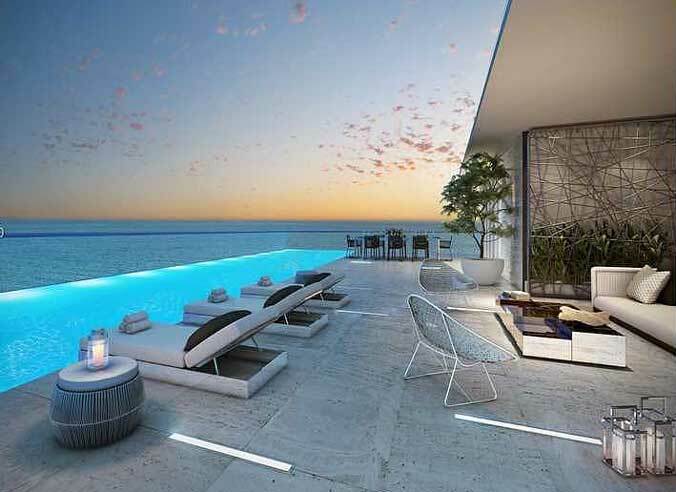 Located at 18501 Collins Avenue, Turnberry Ocean Club should be fully complete by 2018, and already people have been flocking to the building to see just what it will have to offer. The building promises to provide residences with a true luxury experience when they choose to make their home there, and once you start to learn more about the features and amenities provided, it will become easy to see why this building is already garnering so much attention. The building will feature 154 residences, and those residences will range in size from 2,570 square feet all the way up to more than 10,000 feet for the largest residence in the building. 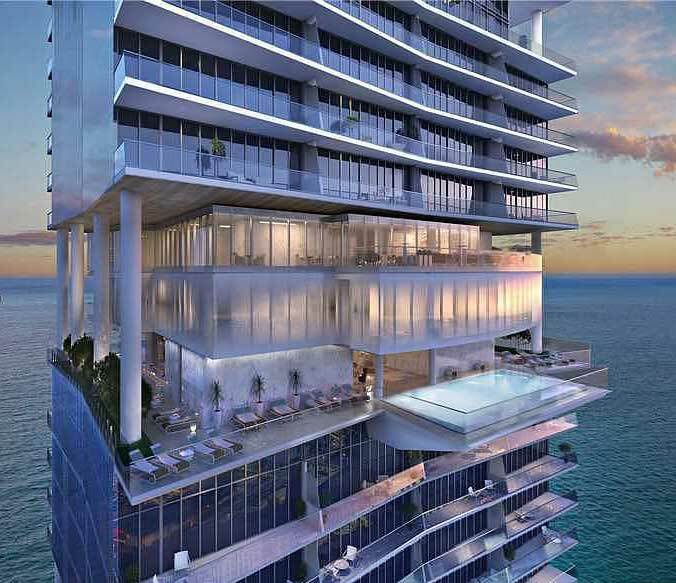 The building will be an all-glass structure on the exterior, which will help to make it a truly stunning addition to the Miami area from an architectural and aesthetic standpoint. The residences come in a range of sizes. You can find three-bedroom condos that are from about 2,750 square feet, and four-bedroom units that are starting at 3,635 square feet. 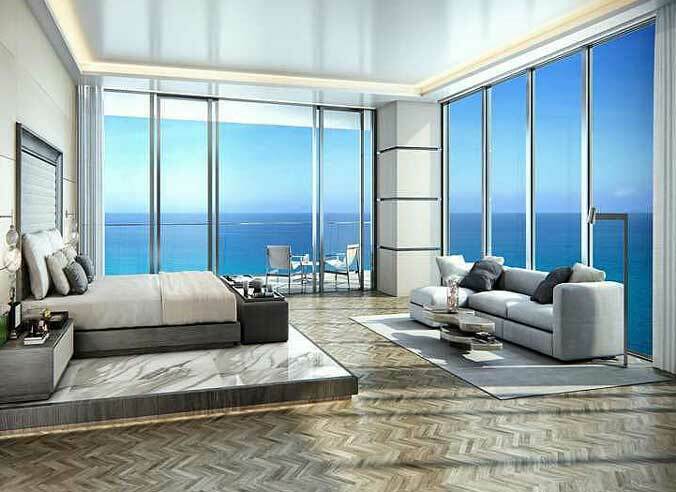 The five-bedroom condos start at 6,695 square feet, and the largest units – six bedrooms – have around 10,645 square feet. The residents have staff quarters, as well as a family room. These are luxury units that have some of the finest amenities you will find. They have large walk-in closets, along with 10’ ceilings in most of the residences. The duplex units have 20’ ceilings in the living room and the balconies. Speaking of the balconies, they are quite large – 11’ deep – and they can provide you with some wonderful views. You will find stone countertops, high-end appliances and flooring, direct elevators to the residences, a private service entrance, marble walls and flooring in all of the bathrooms, quality plumbing fixtures and hardware throughout, and all in one toilets/bidets in every master bedroom. Those who want to live in luxury will find that the amenities at Turnberry Ocean Club make it possible. The building has a beachfront infinity edge pool, and there are three pools located across the property. There are also three bar and lounge areas on the property. The indoor private club features a massage room, spa, wine room, dining area, a library, relaxation room, and a gym and fitness center complete with locker rooms. The building has a valet, a multilingual concierge service, a kid’s club, cabana furnished guest suites, an outdoor pet retreat and dog walk area on the 32nd floor, and so much more. This is the perfect place to call home if you want to live in luxury. This is one of the most popular upcoming buildings in the Miami area, and you can be sure the units are going to sell very quickly. Given the great location that’s right along the water, the amenities in the building and the luxury amenities in the residences, it is easy to see why the excitement is so high. Make sure you get in touch with a real estate agent soon to get yours.